His bicycle seemed like it might flip over front ward with the huge freight of banana bread that filled his basket. He pushed down steadily on the wooden pedals with old, but tautly muscled calves. His sun‑bleached eyes had dimmed in power but his instincts knew where to find the tourists like a captain knows where to find the fish long after the colors of the water and the sky slid together like a cocktail left too long to linger on a bar. Banana trees abound in Old Town. Their fragrances intertwine with the gardenia, salt water and sweat of the days. Imagine his kitchen! The heady smells of mashed, rich, ripe bananas, brown sugar and a hint of rum mixing in with the toasting nuts and the equally as woozy, drunken scent of vanilla. Enough to make the bees swoon! The windowless space would trap none of this baker’s perfumes! 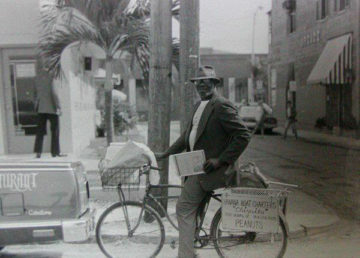 I’m sure little children would go wild thinking of ways to get some free “banana manna” from this Bahamian gentleman. When did he cook his banana bread I wonder now? Was it in the middle of the night so as to work when the Sun would finally roll over it’s heavy weight like a drowsy lover, or perhaps he would slip the yellow‑golden loaves in the ovens around noon and head over to the The Bottle Cap or Che‑Che’s for a few cold “blue runners” to relax before he would go home, wrap them in paper bags and head down to Mallory or cruise Duval to make his living. “Banana Bread. Banana Bread. Get it while it’s hot and don’t blame me when it’s gone”. See ya in the next world, Banana Man.